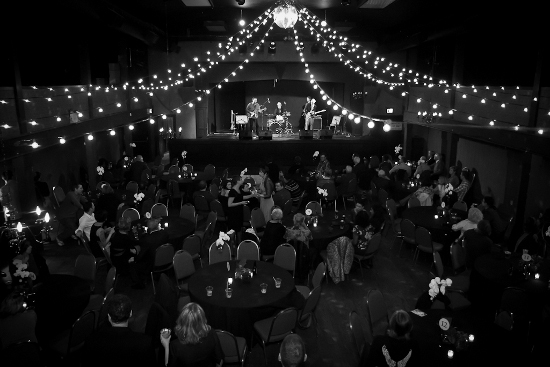 The WISE Hall was built in 1926 and exudes a vintage west coast performance hall feel. From the warm acoustics, to the whiskey-soaked floors, the WISE is a truly indelible venue. The hall features WISE-produced events, and is also available for rent (see below for full details). Please see our Events Calendar for upcoming events. The WISE is perfect for a wide range of events: live music, dance performances, fundraisers, markets, cabarets, book launches, tastings, weddings, receptions, celebrations, work parties, short-run theatre productions, dance classes and more. The WISE proudly supports local artists & promoters and is willing to negotiate different rates for qualifying projects and events. Contact us. You’ll note on arrival a set of railed stairs leading into the Hall. The wheelchair accessible entrance is around back. Please inform the door person of your arrival at the front entrance and they will open the back-ally entrance. Once inside, you’ll find a spacious wood-floored hall, open concept, tables and chairs set up throughout. The stage (accessible only via stairs) is to your left, and the washrooms towards the back of the hall. The washrooms will be marked “gender neutral”. Read the Radical Accessibility Mapping Project’s WISE Hall overview or complete audit. Unrestricted street parking northward between Commercial Drive & Victoria Drive. * Please note, due to licensing, all events with a WISE bar MUST be 19+. No exceptions, it’s the law. WISE policy is that a bar must be run on week-ends. The WISE does not allow renters to run their own bar. ** The WISE Hall does not have a kitchen and is not able to provide catering, however renters are welcome to bring in their own. ***The WISE Hall is located in a residential neighbourhood; while outside, all members and guests are expected to respect the venue and our neighbours by smoking in the designated area and keeping voices at a reasonable level. Daytime $70/hour or $45/hour for registered non-profits & arts rehearsals. Some conditions apply to specific events, please read through entire section. All renters are responsible for: set-up, take-down, bussing tables & security, as well as door staff & door floats for their events. There are staff available, at a fee, to take care of these duties should you not wish to. The venue is restricted to a strict sound level limit of 90 dB inside the venue. Bar service ends at 12 am Monday through Thursday and at 1am Friday and Saturday. Guests must vacate the venue no later than 30 minutes following service end time. For all inquiries related to public events, private events and promoter bookings please contact us at bookings@wisehall.ca. For general inquiries please contact us at info@wisehall.ca.